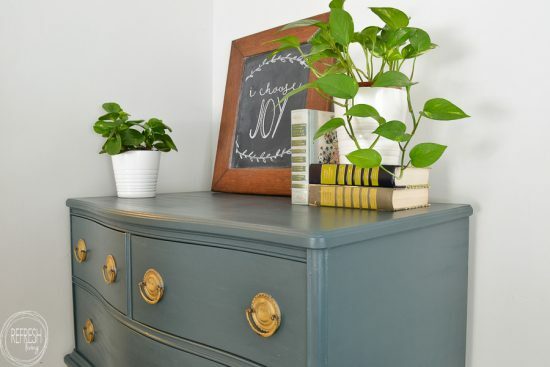 Make your own chalk paint in any paint color with a paint sample from the hardware store and this easy DIY recipe. 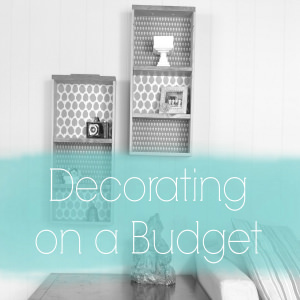 Any piece of furniture can be easily updated with these tricks. 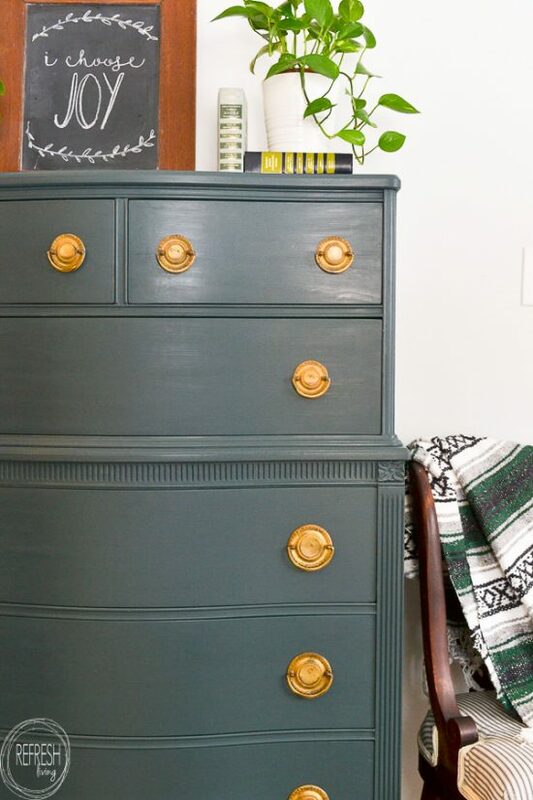 This vintage dresser was given a new look with dark green paint and cleaned up brass hardware. 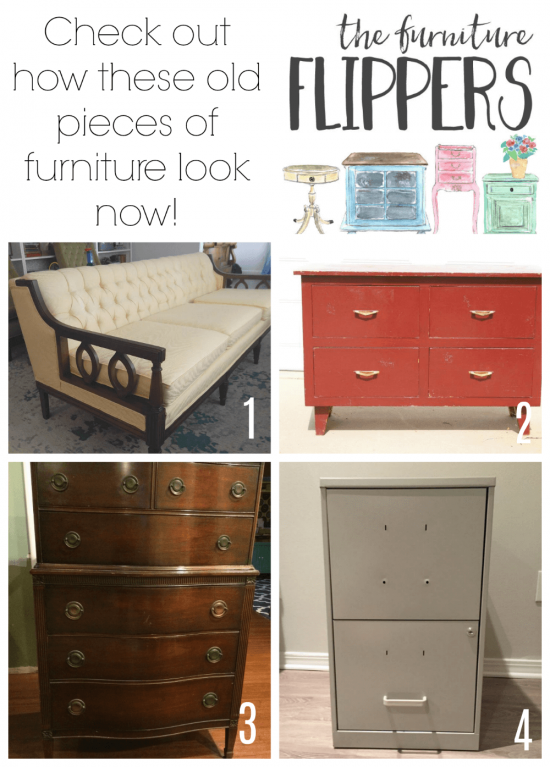 It’s time for another round of Furniture Flipper projects! I chose to update a piece that was already in my home, but needed a facelift. 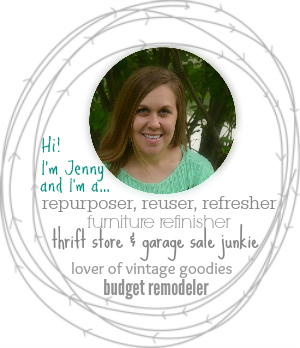 At the end of the post, be sure to check out the other projects for furniture refinishing tips and inspiration! I found this dresser several years ago when going through my grandparents’ furniture at our lake house cottage. They had quite a few of these gorgeous, Hepplewhite style dressers, all of which I have kept in their original form, but this one was in the worst shape of them all. The veneer was coming off in a few places, but the bones were super solid, it was a great size with massive drawers, and the hardware was in tact. A few years ago, I decided to bring this dresser into our bedroom and use it as my main clothes storage. 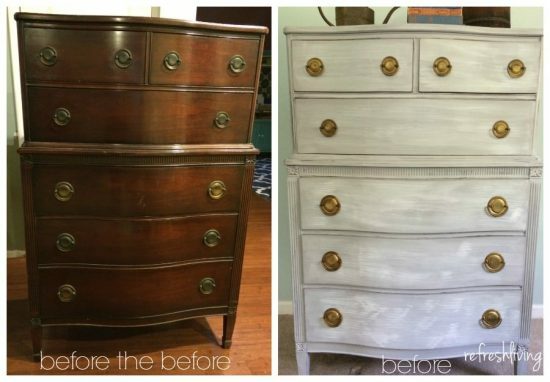 I also wanted to hide some of its flaws and change the overall aesthetic of the dresser, so I decided to paint it. You can see I chose to paint it gray with some light whitewash, but I quickly became bored of the look, and honestly didn’t love how the hardware looked with the gray. When painting furniture, you want to be sure to choose the proper paint for the piece. The trouble is, there are SO many options out there and each one has its pros and cons. (I have a full post breaking down all of these types of paints and the best uses for each one here: The best paint for furniture.) I love using paint specifically designed for furniture because it adheres very well, but this limits my choice of color. Instead, I often choose to make my own DIY chalk paint with a color sample (pint) of paint from the hardware store. 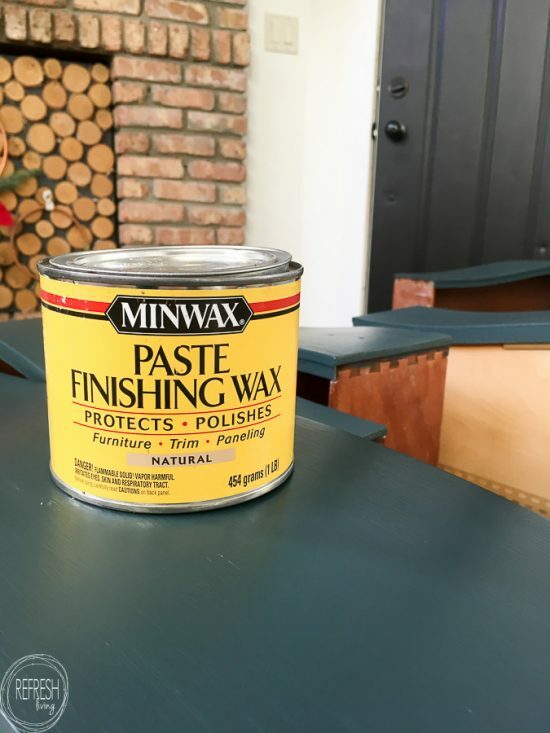 You can use the paint straight from the can on furniture, but if you choose to do that, you want to be sure to sand the piece well (or give it a coat of primer) so the paint has something to adhere to. Making a DIY chalk paint from this same paint allows you to eliminate this extra prep because it adheres better to finished surfaces. 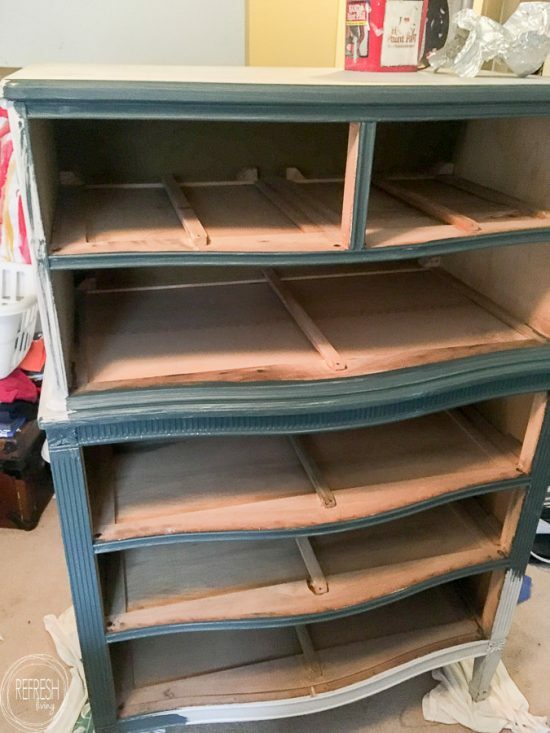 I do want to mention that if I was painting this dresser from its original state, I would definitely need to prime it first, no matter what paint I chose to use. Because the veneer is either cherry or mahogany, the tannins will bleed through the paint. I prefer using a clear shellac to prime these types of pieces, but there are other options for how to prime furniture before painting here. 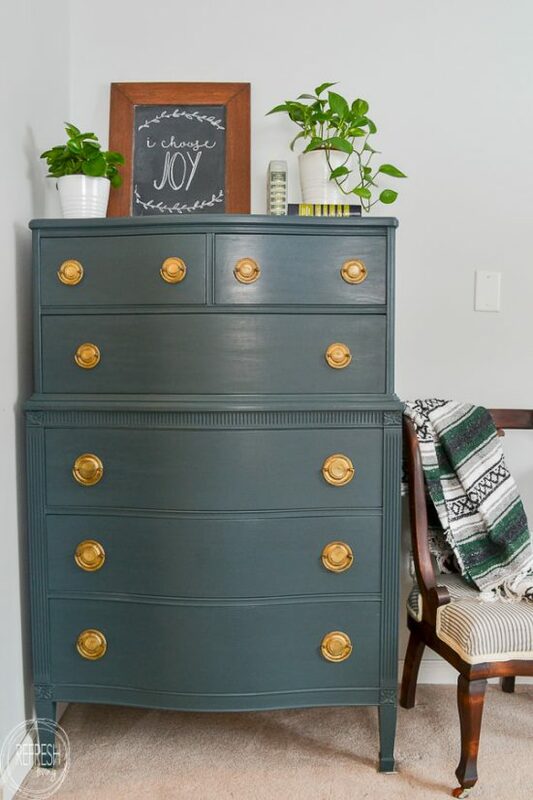 Because this dresser was previously primed when I first refinished it, all I needed to do was whip up my DIY chalk paint and paint two coats onto the dresser. After painting and letting it dry, I used Minwax Paste Finishing Wax to seal it up and give it a light sheen and a protective coat. I use a piece of cheesecloth or a thin towel to rub the wax into the piece, and then once it loses its tackiness (usually after about 15 minutes), I buff the entire surface with a clean rag. I have so much to saw about the topcoats I choose to use for different pieces and why, but all of those are being drafted in another post. I’ll be sure to link it here once its finished! Here’s how the dresser looks now. I love the brass handles so much more now that they are on this dark green than how they looked with the gray. Here’s my favorite way to clean brass hardware to bring it back to looking shiny and new. The specific color I used for this piece was Narragansett Green by Benjamin Moore. Samples of their paint come in one pint containers and are the perfect amount for a dresser this this. I used most of the pint, but still have some left over. I also store these in small glass baby food jars and label them so if I need to touch something up later (which is inevitable when you have 3 young kids running around), I can easily do so. Here’s some good news. 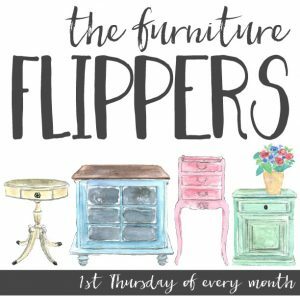 The furniture flipping fun doesn’t stop here! 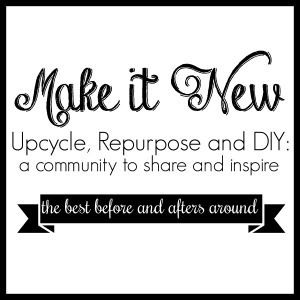 I’ve teamed up with a few other bloggers that are amazing at taking discarded pieces and making them beautiful again. Check out what they’ve been up to this month by clicking the links below! The dresser looks great! And those drawer pulls are perfection. Great work!